Ueckermünde, a small seaside resort town on the bank Stettiner Haff, has been distinguished in the past as being family and senior friendly.This small town has become a tourist attraction due to its restored old town and proximity to the water. However, in terms of history, the town has also been the scene of several chapters of the darkest history.In 1875, “the oldest of the Pomeranian provincial insane asylums (Provinzialirrenanstalten)” opened in Ueckermünde.During the Nazi era, cruel crimes against humanity were committed there.For the targeted killing of disabled children, the Nazis established the “Children’s Department” in 1941.The crematorium, built in 1940, was used for the disposal of the many fatalities.Today, a memorial recalls the atrocious crimes which took place on what are now the grounds of the AMEOS clinic.These dark shadows have clung to the city despite its idyllic location. As a human rights activist, Ernst Klee was known for his critical reporting and attitude towards psychiatric institutions in the former GDR. In 1991, he educated the public about the abuses perpetrated in these institutions. Ueckermünde Psychiatric Hospital was one of many institutions that became tragically infamous for its inhuman treatment of patients. Along with mentally disabled people, mentally ill people from the surrounding area were also housed there in huge dormitories without any regard for a need for privacy. Forced treatment with medication and confining non-conformists in cage bedswere part of everyday life in the psychiatric institution. The psychiatric ward was vastly overwhelmed with the task of caring for patients. There were only 65 beds available for patients with acute mental illness. The clinic had to provide care for a district with a population of 530,000. In 1993, in the documentary “The Hell of Ueckermünde – Psychiatry in the East”, Klee reported on the undignified housing of people with multiple disabilities who were in need of protection. Although Klee contributed to uncovering these violations of human rights, he was highly criticized for the way they were reported. He violated personal rights by revealing the film footage; however, this was the only way to make clear to the public the extent of the abuse committed which had been committed against human beings. Süß accused him of “blatant pessimism”and stressed that the scenes shown in the film are a “burdensome legacy” of the psychiatric hospital Ueckermünde, which had “already been reformed”.At that time, people with mental illnesses had long since benefited from the reforms that had been implemented. The report Zur Lage der Psychiatrie in der ehemaligen DDR(The Situation of Psychiatry in the Former German Democratic Republic), for which mainly East German “psychiatry experts” had been commissioned to work after the fall of the Berlin Wall, shows the extent to which attempts were made after 1989 to sweep the injustice committed against people under the carpet.This states that the employees working in the psychiatric hospitals of the former GDR were highly motivated and not accountable for the circumstances and working conditions at the facilities.This questionable insight, however, does not change the fact that those shown in the documentary were involved in destroying human lives.Despite all criticism of Klee, the inhumane treatment in the aforementioned psychiatric hospital does not remain the only dark chapter in the history of psychiatry that has been poorly and inadequately dealt with. Klee did not paint a dark picture, but rather documented images that serve as a warning to future generations. In an attempt to provide more progressive treatment for the mentally ill, the Rodewisch Thesespublished in the 1960s were created to initiate reform efforts in the psychiatric wards of the former GDR. The aim was to counteract the public exclusion of mentally ill people and to promote positive developments in health care. For mentally ill people, for example, basic financial security was provided. An improvement in finances was possible for those affected, at least in agriculture.Süß provides evidence of the success of the reforms with statements from the “professional living recollections of a doctor”. A one-sided position without making reference to the patient’s perspective is adopted not only in their research reports but also in the vast majority of these reports in general. To what extent these lauded measures were beneficial for the lives of the patients cannot be conclusively answered due to insufficient research results. Then, like today, people with mental illnesses had to contend with prejudice. The patients “treated” in Ueckermünde were known to the public in smaller cities and were marginalized in society. Since 1990, data has been available that allow conclusions to be drawn about the public’s perception of people with mental illness. The study tends to show greater disapproval of people who are treated for alcohol abuse or who suffer from schizophrenia. In the debate about discrimination and exclusion, the public hardly receives any information about the fates of those who have had to undergo coercive measures in psychiatric institutions due to mental illness. The media only occasionally provide information about crimes committed by acutely ill individuals admitted to psychiatric institutions. In this context, no reference is made to the difference between “criminal accommodation under the Criminal Code (StGB) and public accommodation under mental health or accommodation laws.”In the minds of the people, a distorted image of the affected group of people is created.Not only external influences such as media coverage, but also the lack of understanding in the social and family environment exacerbate the pressure on those affected. In addition, the structural discriminationand stigmatizing viewsthat can even find their way into the medical profession make the recovery process more difficult in some places. This also illustrates the imbalance in the balance of power between doctors and their patients.People who have been caught in the mills of medical assessment can become more often victims of the arbitrariness of those in positions of authority, as the case of Gustl Mollath has revealed. The primary aim of this article is to raise public awareness of people’s fates and to discuss a topic that is not sufficiently addressed by the population and the media. This “making visible” is based on the guidelines of the Disability Policy Guidelines, which call for the timely implementation of the objectives set out in the UN Convention. In Ueckermünde, the processing and procedures for dealing with patients behind closed doors at different times and in different political systems are far from complete. Since there are hardly any documented testimonies of patients formerly treated in Ueckermünde, we will now present the first findings and interpretations of Elisa’s history, which are dealt with in more detail in subsequent articles. Elisa was a lifelong friend of Judi Klein and is a main character in my book “The Voices of Those Remaining”. The exclusion associated with the stay in a psychiatric hospital, which was not only carried out in her own family by her brother on her mother’s side, but also the public stigmatization in the social environment of her hometown prevented her from returning to the life she had dreamed of. After her stay in the psychiatric clinic in Ueckermünde, she was initially prevented from continuing her schooling. […] In addition to this, she was also denied any further training. She was only allowed to work in agriculture for a minimum subsistence income, which she was never able to cope with until her death in 2002. The inadequate training of the educational and psychiatric-psychological staff in Neubrandenburg after 1989 […], which was to be counteracted with the opening of the Clinic for Psychiatry and Psychotherapy in 1993 […], also did not bring about the desired success for Elisa. 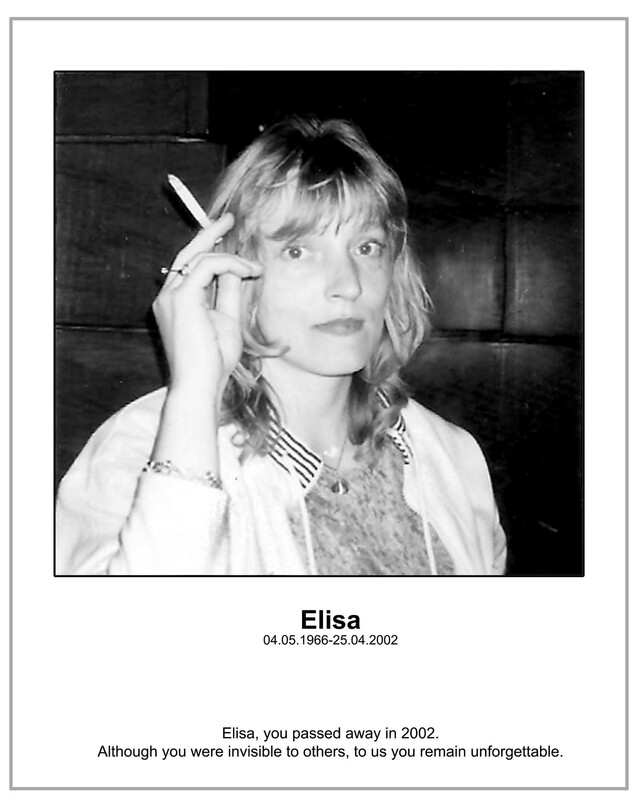 Elisa’s lifeless body was found in her mother’s apartment. She had fastened a plastic bag around her head. She left a goodbye note written in shaky handwriting on the card addressed to her mother for her 60th birthday. On this card Elisa also asked for forgiveness from her former partner and Judi Klein. Just one day after Elisa’s suicide, employees at the Steg cleared out her apartment. Judi’s attempt to counter this failed. Two days after Elisa’s death, her mother was transferred to a nursing home for the elderly, an action which Elisa had fought against for so long. With regard to the problems that exist in German psychiatric institutions, reference should be made to the statement made by the UN Special Rapporteur on Torture, Juan E. Méndez, who in 2013 declared compulsory drug treatment without the patient’s consent to be torture under certain circumstances.According to Méndez, such psychiatric forced treatment must be immediately stopped. Such a statement made by a person with major political responsibility is unacceptable for our society. If issues that already have no social reality in the public eye are not even taken seriously by the German Federal Government due to a lack of expertise and the expertise of political leaders, we are far from being a society that aims to be open to everyone, in spite of the reorientation in psychiatric-psychotherapeutic practice, the dedicated commitment of numerous people and the support of various organizations. Despite legal regulations, improper treatment of patients and the misuse of the responsibilities of on-site nursing and medical staff in psychiatric institutions cannot be ruled out. It is fitting not to disregard the fact that changes in the law in recent years, in particular the basically obligatory appointment of a procedural guardian in connection with commitments under the Psych-KGsof the Federal States (Länder) or of commitments under the German Civil Code (Bürgerliches Gesetzbuch) in connection with the provision of commitments, have led to a strengthening of the rights of the individuals concerned in commitment procedures.Since 2012, the requirements for forced treatment have been anchored in the German Civil Code.Nevertheless, mistreatment and abuse of power in psychiatric institutions cannot be ruled out. The reasons for improper treatment and possible misuse of responsibility are complex. Excessive demands and stress on the part of the medical personnel can lead to an increased probability of misdiagnosis, as the time required for in-depth examinations is too short for the individual fates of those affected. If there are no other regulatory authorities, a misinterpretation of the treatment may continue and consequently lead to a non-medically indicated administration of drugs, in particular neuroleptics. If this medication has no therapeutic purpose and is administered against the will of the person concerned, the UN Special Rapporteur Méndez states that torture has occurred. In addition, excessive demands, time pressure and attending to too large a number of patients also lead to an increased probability of indifference and insensitive behavior towards those concerned, which would amount to an abuse of a position of responsibility. The person concerned is subject to the system of psychiatry and the individuals acting within it and their decisions and remains at the mercy of the will of others. It is likely to be virtually impossible for the persons concerned to prove improper treatment at a later time. In recent years, the scholarly and public treatment of psychiatry in Ueckermünde has been rather one-sided and limited to the documentary “The Hell of Ueckermünde – Psychiatry in the East”, in which the suffering of people with multiple disabilities is depicted. The hell of Ueckermünde was to remain a warning example for all eternity. Numerous projects to improve psychiatric practice and care have been initiated by the State Association of Social Psychiatry. After 1993, the premises of the former Christophorus Hospital and today’s AMEOS Clinic were partially redesigned and staff increased or restructured. Nevertheless, it is well-known that up until the 2000s a questionable complex therapeutic program was in place. This consisted, among other things, of shared accommodation for people with mental and physical disabilities in the socialist prefabricated building Haus 40. For the latter group of people, this dilapidated building still serves today as a dormitory, located across from the Morgenstern preschool, which is in front of or behind the sports field of the prison, depending on the perspective in question. The website of the AMEOS Clinic for Psychiatry and Psychotherapy in Ueckermünde proudly boasts of a 140-year tradition.Critical visitors to the website may well ask themselves what tradition means from the point of view of the clinic? To this day, the public has not been informed about the whereabouts and further state of health of the people shown in the documentary by Ernst Klee. There is also no detailed information about the professional career of the staff depicted in Klee’s documentary. Many of the patients who received psychiatric treatment at this location during the GDR era and years after the fall of the Iron Curtain, important contemporary witnesses, have not yet been asked about their experiences with the medical staff. Psychiatric abuse of power in this institution as well as in other similar clinics in the former GDR was hardly mentioned in official reports and mainstream media after 1993. Therefore, even today it is advisable to carry out a precise and transparent examination of the treatment methods at the “closed” clinic at Ueckermünde and in other psychiatric institutions. To ensure a systematic review of the past, the research work should address patients formerly treated in Ueckermünde with qualitatively and quantitatively oriented survey procedures. Collaboration in an interdisciplinary research group seems to be significant for ensuring a realistic depiction of what really took place. The role and interaction of medical, educational and psychological specialists with patients as well as the relationships between psychiatry in Neubrandenburg and in Ueckermünde must be examined in detail. At this stage, the political role of the physicians working in outpatient clinics in Neubrandenburg, their connections to psychiatry in Ueckermünde and the resulting treatment of their patients, both during the GDR era, after the Reunification and well as today, should be examined in more detail. In addition, the patient’s perspective on the successes and failures of the Psychiatric Clinic in Neubrandenburg, which opened in 1993, the Social Psychiatric Services and other support facilities for the mentally ill should be included. For example, research into the psychosis group founded in 1994, the role of personnel retrained in the urgent procedure for mentally ill individuals, and the possible abuse of power in these positions could be investigated. The processing of cases related to abusive treatment in the psychiatric wards of the former GDR must not be forgotten. It is only in an informed society that people who depend on psychiatric-psychotherapeutic support can feel safe in crisis situations. Final Report of the Commission on the Investigation of Abuse of Psychiatry in the Saxon Region of the Former German Democratic Republic (December 1196), edited by the Saxon State Ministry for Social Affairs, Health and Family Affairs, 161 S., Dresden 1997. Angermeyer, C. Matthias; Matschinger, Herbert; Schomerus, Georg: 2013: Attitudes towards psychiatric treatment and people with mental illness: changes over two decades. The British Journal of Psychiatry Aug 2013, 203 (2) 146-151; DOI: 10.1192/bjp.bp.112.122978. Bernhardt, Heike 1992: Die Anstaltspsychiatrie in Pommern 1939 bis 1946. Ein Beitrag zur Aufhellung nationalsozialistischer Tötungsaktionen unter besonderer Berücksichtigung der Landesheilanstalt Ueckermünde. (Psychiatry in Pomerania from 1939 to 1946. A contribution to the elucidation of National Socialist killing campaigns with special focus on the Ueckermünde regional psychiatric institution.) Dissertation. Leipzig. Germany denies torture before the UN Disability Rights Committee in Geneva on March 27, 2015: accessible online at: https://www.youtube.com/watch?v=vUkQpwjoh7M. Civil Code (BGB) § 1906 Approval of the guardianship court for commitment: accessible online at: http://www.gesetze-im-internet.de/bgb/__1906.html. Detjen, Joachim 2007: Politische Bildung. Geschichte und Gegenwart in Deutschland. (Political education. Historical and contemporary history in Germany.) Oldenbourg Wissenschaftsverlag Gmbh. Munich. Dieckhöfer, Klemens 1996: Brennpunkte der deutschen Psychiatriegeschichte zur Menschenwürde. (Focal points of German psychiatric history on human dignity.) Accessible online at: http://www.psychiatrie-und-ethik.de/wpgepde/wp-content/uploads/1996/12/RB1996.pdf. Dieckhöfer, Klemens 2009: Gab es systematischen Mißbrauch der Psychiatrie zu politischen Zwecken. (Was there systematic abuse of psychiatry for political purposes?) Accessible online at: http://www.psychiatrie-und-ethik.de/wpgepde/wp-content/uploads/2012/01/RB200901.pdf. Dieckhöfer, Klemens; Weinberger, Friedrich 2015. Professor Schafarewitsch on the intellectual orgins of psychiatric abuse. Accessible online at: http://www.psychiatrie-und-ethik.de/wpgepde/. DIFM (German Institute for Human Rights) 2013: Expertise for an article law on the implementation of the UN Convention on the Rights of Persons with Disabilities in the State of Berlin. Brief description of the standards review, basics, methodology, reading samples. Monitoring center for the UN Convention on the Rights of Persons with Disabilities. German Institute for Human Rights. Accessible online at: http://www.ssoar.info/ssoar/bitstream/handle/document/36807/ssoar-2013-Expertise_fur_ein_Artikelgesetz_zur.pdf?sequence=1. Discher, Christian 2015: Ueckermünde und die Übriggebliebenen Psychiatrien in Deutschland. War die Hölle von Ueckermünde nie verschwunden? (Ueckermünde and the remaining psychiatric hospitals in Germany. Has the hell of Ueckermünde ever ceased to exist?) https://inklusionspolitik.de. Discher, Christian 2015c: Die Stimmen der Übriggebliebenen. underDog Verlag. Hamburg. 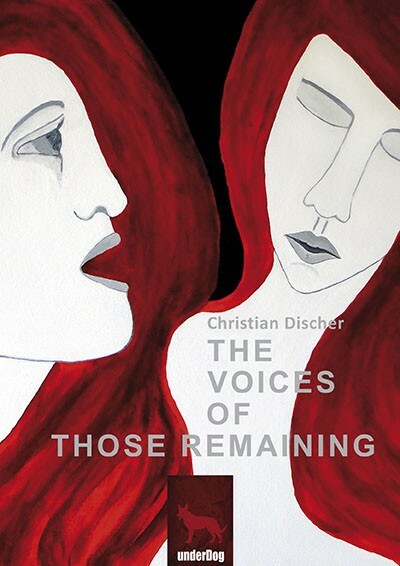 Discher, Christian 2015c: The Voices of Those Remaining. Hamburg: underDog Verlag. Hamburg (English version published in December). Haas, Stefan (1994): Mißbrauch der Psychiatrie-mißbrauchte Psychiatrie. (Abuse of psychiatry-abused psychiatry.) Accessible online at: http://www.psychiatrie-und-ethik.de/wpgepde/wp-content/uploads/1995/11/RB199501.pdf. Israel, Agathe 2008: Frühe Kindheit in der DDR. (Early childhood in the GDR.) Online journal of the German Psychoanalytical Association DPV. Accessible online at: http://www.psychoanalyse-aktuell.de/321+M54b1f5bf267.0.html?&tx_ttnews. Klee, Ernst 1993: The Hell of Ueckermünde. Germany’s remotest psychiatric ward, in: Klee, Ernst 1993: Irrsinn Ost, Irrsinn West. Psychiatrie in Deutschland (Madness East, Madness West. Psychiatry in Germany) Fischer. Frankfurt am Main. Klee, Ernst 1991: Psychiatrie in der DDR. Eine erste Bestandsaufnahme. Wecken um halb vier. In den baufälligen Nervenkliniken wurde mehr verwahrt als gefördert. (Psychiatry in the GDR. A preliminary review. Wake up at half past three. In the dilapidated mental hospitals more was preserved than fostered. )DIE ZEIT Nr. 27 – 28. Juni 1991 – page 77 From the archive at ZEIT. Accessible online at: http://www.zeit.de/1991/27/wecken-um-halb-vier. Klein, Judi 2014: Fatum. Mecklenburger Verlag. Neubrandenburg. Riggenbach, Björn 2007: Achtung, Freiheit und Macht in der Arzt-Patienten Beziehung (Caution, freedom and power in the doctor-patient relationship), in: Ausfeld- Hafter, Brigitte (editor). Medizin und Macht. Die Arzt-Patienten-Beziehung im Wandel: mehr Entscheidungsfreiheit? (Medicine and power. The doctor-patient relationship in change: more freedom of decision?) Peter Lang AG. Bern. 131-150. Rössler, Wulf 2004: Psychiatrische Rehabilitation. Unter Mitarbeit von Ch. Lauber. ( Psychiatric rehabilitation. In collabaration with Ch. Lauber.) Springer Verlag. Berlin. Rüsch, Nicolas; Berger, Mathias; Finzen A, Angermeyer, MC 2004: Mental Illness Clinic and Therapy, additional electronic chapter on stigma. Accessible online at:http://www.berger-psychische-erkrankungen-klinik-und-therapie.de/ergaenzung_ruesch.pdf. Saxon Hospital for Psychiatry and Neurology Rodewisch. Rodewisch theses. International Symposium on Psychiatric Rehabilitation May 23-25, 1963 in Rodewisch. : Accessible online at: http://www.skh-rdewisch.sachsen.de/fileadmin/user_upload/rodewisch/pdf/Publikationen/Rodewischer_Thesen_1963.pdf. Sonja Süß: 1999. Politisch mißbraucht? Psychiatrie und Staatssicherheit in der DDR. (Politically abused? Psychiatry and State Security in the GDR) Ch. Links Verlag, Berlin. 2nd edition (Scholarly Series of the Federal Commissioner for the Records of the State Security Service of the Former German Democratic Republic;14). Social psychiatry MV. Accessible online at: http://www.sozialpsychiatrie-mv.de/PKP/index.html. Statement by Mr. Juan E Méndez Special rapporteur on torture and other cruel, inhuman or degrading treatment or punishments. 22nd session of the Human Rights Council. Agenda Item 3. 4 March 2013 Geneva. Accessible online at: http://mdac.info/sites/mdac.info/files/march_4_torture.pdf. Tremper, Jürgen quoted from: Links-lamg.de Die Tote Kinder von Ueckermünde. (The dead children of Ueckermünde.) Accessible online at: http://www.links-lang.de/presse/14287.php. Walther, Gerd (mayor). Accessible online at: http://www.ueckermuende.de/index.html. Zum Mißbrauch der Seelenheilkunde: Schaden für Einzelne. Gefahr für alle. (On the Abuse of Psychiatry: Harm to Individuals. A Danger to All.) Accessible online at: Walter von Baeyer Society for Ethics in Psychiatry e.V. (GEP): http://www.psychiatrie-und-ethik.de/wpgepde/wp-content/uploads/2012/01/rb201001.pdf. Zur Lage der Psychiatrie in der ehemaligen DDR- Bestandsaufnahme und Empfehlungen. Im Auftrag des Bundesministeriums für Gesundheit. 1991: Accessible online at: http://www.apk-ev.de/publikationen/BMG-Bestandsaufnahme%20und%20Empfehlungen.pdf. Judi Klein writes about her life in her books. They are the memories of an injured soul whose voice was not heard during her childhood. In the form of poems, memoir and excerpts from medical records, the reader gains insights into the inner life of a woman who was labeled a “schizophrenic” at a young age. The lack of understanding in her environment, a closed, defensive attitude in her family and among the doctors led her down a path she could not leave of her own accord for a long time. Judi Klein willingly confronts the public and binds a readership that wants to look behind the façade of socially excluded people. Today Judi Klein uses writing to try to come to terms with the trauma of the past. Judi Klein and Christian Discher share a deep and long-lasting friendship. Cf. Walther, Gerd (mayor) http://www.ueckermuende.de/index.html. Focal points of German psychiatric history on human dignity: Cf. Dieckhöfer (1996). Bernhardt (1992: 2) quoted n. Klee (1993:11). Klee (1993:11) reports more than 3000 fatalities, while other sources now estimate 3556. In addition, there were 889 deportations within the framework of the “T4” murder of the sick campaign. Tremper quoted n. http://www.links-lang.de/presse/14287.phpDie Toten Kinder von Ueckermünde (The Dead Children of Ueckermünde).(2014). Bernhardt (1992: 85ff.) quoted n. Klee (1993:218). “Hans Hefelmann, official of the Führer’s Chancellery who he was responsible for organizing the children murders, recalled in his statement dated November 9, 1960 that the children’s department had been in an institution “in the western part of the lagoon, northwest of Stettin” (Js 148/60, GStA Franfurt/Main). Cf. Bernhardt (1992: 72) quoted n. Klee (1993:11). Pictures of cage beds: accessible online at https://www.flickr.com/photos/96964423@N03/14961252944/in/photostream/. Cf. The Situation of Psychiatry in the Former GDR – Review and Recommendations. Commissioned by the Federal Ministry of Health. (1991:4). “From the ruling dictatorship of the former GDR with the corresponding awareness of authority the poverty of the patients in the large psychiatric hospitals can also be deduced. This was made possible by a subservient attitude, as well as by the unclear legal situation of the committed. However, ultimately it was also made possible due to the background of general indifference.” Haas (1994:3). Cf. Süß (1999:73) Rodewisch Theses: accessible online at: http://www.skh-rdewisch.sachsen.de/fileadmin/user_upload/rodewisch/pdf/Publikationen/Rodewischer_Thesen_1963.pdf. “In 2011, respondents expressed a stronger desire for social distance from people with schizophrenia than two decades earlier. …[…] In 2011 as in 1990, people with alcohol dependence faced the strongest rejection, followed by people with schizophrenia and those with depression […]”Angermeyer et al. (2013:3). On the Stigmatization and Stereotyping of Mentally Ill People: Cf. Rüsch et. Al (2004). “Structural discrimination describes the negative consequences for mentally ill people resulting from imbalances and injustices in social structures, political decisions and legal regulations.” Rössler (2004:854). “Public stigmatization consists of three elements – stereotypes, prejudices, and discrimination – relating to a power gap between members of the general public and the stigmatized minority.” Rüsch et al (2004:5). [Original bold]. Cf. Rüsch et al (2004:5). “If one sees in humankind nothing but a mixture of social or biological forces, then the concepts of guilt and punishment lose all meaning, as they are meaningless when applied against a machine. Just as a broken computer is not brought to justice and not punished, but repaired, it also becomes “necessary” to repair a person who stops working according to the official program. There are special psychiatric hospitals for exactly this purpose. This conclusion is so inevitable that even an early materialist like Weitling, a forerunner and teacher of Marx, painted the picture of a future society “of freedom and harmony,” in which there would be no more legal proceedings and no more trials, in which rather all those “possessed by wicked passions” would be put into hospitals and the “incurable” would be kept on special island colonies. This is a typical utopia dreamed up by a terrible phantom. How much scarier is the utopia that created real life? In the (still small) model it shows us what awaits us in the not too distant future. A taste of this is given when psychiatrists, obviously in all seriousness, explain to compulsorily admitted “patients” that their religious beliefs or their critical attitudes towards life, their “lack of social adaptation,” as doctors say, are a clear symptom of mental illness. […] Schafarewitsch, Igor (1978) quoted by Weinberger; Dieckhöfer (2015). http://www.psychiatrie-und-ethik.de/wpgepde/. On the 10 disability policy guidelines: Cf. http://www.berlin.de/imperia/md/content/balichtenberghohenschoenhausen/behinderten/10bpl.pdf?start&ts=1432796667&file=10bpl.pdf. This reflects the concerns formulated in the UN Convention on the Rights of Persons with Disabilities. It elevates the rights of the disabled “to the basis and standard of political action and provides the legal framework.” DIFM (2013:4) “According to the Convention, disabled people should be able to make use of human rights on an equal footing with others.” DIFM (2013: 12). Süß also investigated the question of whether there had been systematic political abuse of psychiatric facilities in the former GDR. A report by the Saxon State Ministry for Social Affairs, Health and Family denies this abuse. Cf. quote from Süß (1999: 112) “The German Medical Journal (Deutsche Ärzteblatt), the official publication of the Federal Chamber of Physicians (BÄK) and the National Association of Statutory Health Insurance Physicians (KBV) similarly circulated such information. A similar statement was made by the World Association of Psychiatry in 1999. And similarly, the general public in Germany and internationally was appeased.” Weinberger (2009: 120). The Walter von Baeyer Society for Ethics in Psychiatry reported regularly on cases of political abuse in the psychiatric facilities of the former GDR, which met with little public interest. Cf. Weinberger (2009: 120). To what extent a schizophrenic condition was present before Elisa’s admission to Ueckermünde in 1982, which was frequently described by Elisa as forced treatment with restraining methods in cage beds, and whether this was a case of political abuse, cannot be assessed according to the authors’ findings. This would require a comprehensive investigation. Elisa told Judi in detail about the constant external influence exerted by the staff at the Steg. On the Brandenburg Theses: Cf. (1999:75). According to the authors, the structural discrimination in Neubrandenburg can be proven by the attempted intervention and intrusion of the pedagogical-psychological staff of the social psychiatric service into the private or intimate sphere. The aim was to achieve complete control over the lives of the mentally ill. In order to gain access to the living quarters, a popular means of sanction was to threaten the patient indirectly with “admission” to the hospital. Cf. Discher (2015c: 163). (Chapter Ms. Hässel). “[…], medical treatments of an intrusive and irreversible nature, when lacking a therapeutic purpose or when aimed at correcting or alleviating a disability, may constitute torture or ill-treatment when enforced or administered without the free and informed consent of the person concerned.” Mendez (2013:4). “States should impose an absolute ban on all forced and non-consensual medical interventions against persons with disabilities, including the non-consensual administration of psychosurgery, electroshock and mind-altering drugs, for both long and short-term application. The obligation to end forced psychiatric interventions based on grounds of disability is of immediate application and scarce financial resources cannot justify postponement of its implementation.” Mendez (2013:5). For public law on commitment in Mecklenburg-Western Pomerania: Cf. §§ 11, 15 PsychKG M-V.
For the commitment under supervision law Cf. § 1906 BGB Approval of the supervision court for the commitment: accessible online at: http://www.gesetze-im-internet.de/bgb/__1906.html. Model projects of the Landesverband Sozialpsychiatrie can be found at http://www.sozialpsychiatrie-mv.de/PKP/index.html . Model Project Social Psychiatry (1998 – 2001), Model Project Communal Psychiatry (2002 – 2005), Model Project KoDE – Cost Reduction in Integration Assistance (2006 – 2008), Model Project Work and Employment TAB-MV (2008 – 2009), Model Project: “Living Longer in MV” (2009 – 2012). The treatment of patients in Ueckermünde is described in detail from the perspective of a seventeen-year-old in Discher’s “Die Stimmen der übrigbliebenen” (“The Voices of Those Remaining”) (2015). Zum Mißbrauch der Seelenheilkunde: Schaden für Einzelne. Gefahr für alle. (On the Abuse of Psychiatry: Harm to Individuals. A Danger to All.) Cf. http://www.psychiatrie-und-ethik.de/wpgepde/wp-content/uploads/2012/01/rb201001.pdf. Cf. Dieckhöher (2009).